Just a few miles north of Ballycastle village is the windswept outcrop of Downpatrick Head which is one of the discovery points on the Wild Atlantic Way in Mayo and hosts the 2014 Spirit of Place, a new installation to commemorate the natural power and richly-layered historical tales of the site. You will also see a lone sea-stack close to the edge of the cliffs. This sea-stack is called Dún Briste (broken fort). Local legend says that when a pagan chieftain refused to convert to Christianity, St. Patrick struck the ground with his crozier, splitting a chunk of the headland off into the ocean, with the chieftain on top! 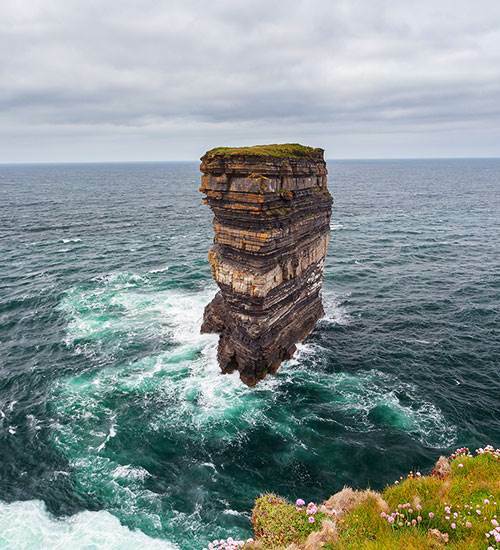 The sea stack is beautiful to behold because you can see the layers upon layers of multi-coloured rock strata.